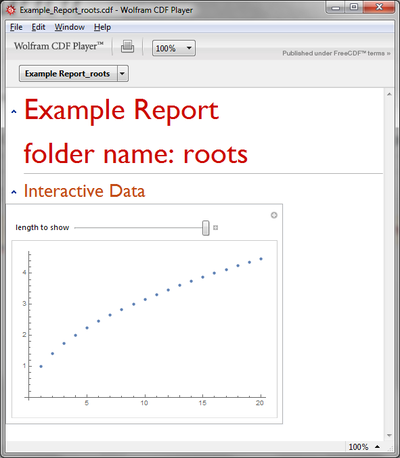 Our Mathematica application obtains a group of input files, analyzes them and generates a report in a form of CDF document. The report contains multiple dynamic/interactive graphs and tables. To save the all required data inside the CDF we use Manipulate with SaveDefinitions ->True. When a section containing a dynamic object appears on a screen, an EnableDynamic button also appears on a top-right corner. To interact with the dynamic object, one should first click on the EnableDynamic button. The problem is that when we try to visually compare two reports (based on two different sets of input files), the dynamic content of the second report overwrites the dynamic content of the first one. This can be avoided if the two CDFs are opened in separate Windows processes. But this is inconvenient and difficult to explain to users. Is there an approach that solves this problem by, possibly, generating of unique name spaces for each automatically generated CDF report? 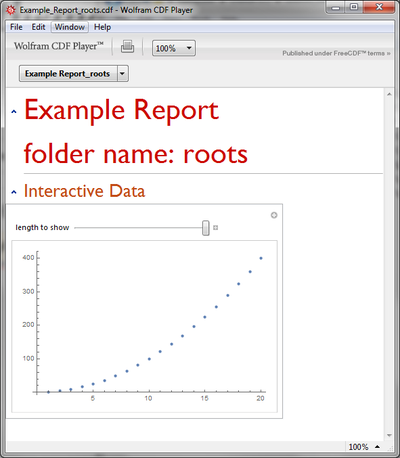 If the data.csv file contains second powers of integers the report present the appropriate interactive visualization. Browse other questions tagged dynamic cdf-format or ask your own question. What are the exact guidelines for what is allowed in a CDF? CDF, Player, PlayerPro, or something else? What are the possible security breaches in CDF content? Creating a CDF file from the command line? Can I output the result of a dynamic module to the rest of a notebook? How to read the .cdf file with dynamic content in the Android-device?